Here follows an excellent study on the changes to the liturgical rites of Holy Week under Pope Pius XII and Archbishop Hannibale Bugnini from 1951-1956 by Fr. Stefano Carusi (IBP), which was initially published in English for the first time by the Rorate Coeli blog. “The whole article is worth careful reading and study. It brought to light a number of details in the new rite that had been missed even by long-time critics of the rites like me. Everyone owes a debt of gratitude to Fr. Carusi and Mr. Palad of Rorate for making this work available. It is worth noting that Fr. Carusi is a member of the IBP (Institute of the Good Shepherd), a Vatican-approved society for priests (mostly former SSPX-ers) who offer the traditional Latin Mass under the banner of Benedict XVI’s 2007 Motu Proprio — which, in theory at least, prescribes the use of the John XXIII Missal that contains the very rites Fr. Carusi criticizes. In October of 1949 at the Congregation of Rites, a liturgical commission was named which would have as its object the Roman rite. (Actually, the commission was named on May 28, 1948, while the constitutive meeting of the commission was held on June 22 of the same year. See Fr. Thomas Richstatter’s “Liturgical Law: New Style, New Spirit”, Franciscan Herald Press 1977, p. 182. CAP.) It was to study whether eventual reforms should be adopted; unfortunately, the calm necessary for such a work was not possible on account of the continual requests by the French and German episcopates demanding immediate changes with the greatest and most precipitous haste. The Congregation of Rites and the Commission considered themselves bound to treat the question of the horarium of Holy Week in order to circumvent the imaginative creations of certain “autonomous celebrations,” especially in regard to the Vigil of Holy Saturday. In this context, it was necessary to approve “ad experimentum” a document that permitted the evening celebration of the rite of Holy Saturday, i.e. the “Ordo Sabbati Sancti” [“The Order of Holy Saturday”] of January 9, 1951. (2) In the years 1948-1949, the Commission was erected under the presidency of its Cardinal Prefect Clemente Micara, replaced in 1953 by Cardinal Gaetano Cicognani; also present were Msgr. Alfonso Carinci, Fathers Joseph Löw, Alfonso Albareda, Agostino Bea, and Annibale Bugnini. In 1951 Msgr. Enrico Dante was added; in 1960, Msgr. Pietro Frutaz, Fr. Luigi Rovigatti, Msgr. Cesario d’Amato, and finally Fr. Carlo Braga. (3) This last-named was long a close collaborator of Annibale Bugnini; in 1955 and 1956, he participated in the work of the commission though not yet a member, and was moreover, along with the aforementioned Fr. Bugnini, the author of historical-critical and pastoral articles on Holy Week (5), which would eventually be revealed as “letters of transit,” so to speak, for the changes which followed. The Commission worked in secret and under pressure from the central European episcopates (6), though it is not clear if their pressure was meant to intimidate or encourage the Commission. So great was the secrecy that the unexpected and sudden publication of the “Ordo Sabbati Sancti instaurati” [“On the Restored Rite of Holy Saturday”] on March 1, 1951, “came as a surprise to the very officials of the Congregation of Rites,” (7) as commission member Annibale Bugnini has stated. This same Fr. Bugnini informs us of the singular manner in which the results of the Commission’s work on Holy Week were conveyed to the Pope: the Pope “was kept informed by Msgr. Montini as well as weekly by Fr. Bea, Pius XII’s confessor. Thanks to this link, notable results could be achieved even in the period when the Pope’s illness prevented anyone else from approaching him.” (8) The Pope was afflicted with a serious stomach malady that required a long convalescence; and so it was not the Cardinal Prefect of Rites, in charge of the Commission, who kept him informed but then-Msgr. Montini and the future-Cardinal Bea, who was to have a great role in the reforms to follow. The labors of the Commission were protracted until 1955, when, on Nov. 16, the decree “Maxima redemptionis nostrae mysteria” [“The Greatest Mysteries of Our Redemption”] was published, which was to take effect at Easter of the following year. The bishops received these novelties in various ways, and, beyond the façade of triumphalism, there were not lacking laments over the introduction of these innovations, and indeed requests began to multiply for permission to retain the traditional rites. (9) But by now the machine of liturgical reform had been set in motion and to halt it in its course would have proven impossible and moreover inadmissible, as the events to follow would demonstrate. Despite the wish that the liturgists should sing, as it were, in unison—compounded by a certain monolithic attitude, which in the 1950’s was meant to show unity of purpose—authoritative voices were raised in dissent but promptly constrained to silence despite their competence. Such was the case not only for certain episcopates but also for certain liturgists, such as Léon Gromier, who, notable for his well-documented commentary on the Caeremoniale Episcoporum, (10) was also a consultor for the Congregation of Rites and a member of the Pontifical Academy of the Liturgy. In July of 1960 in Paris, in a celebrated conference, he spoke his mind [on all of this] in a heated but well-reasoned manner. 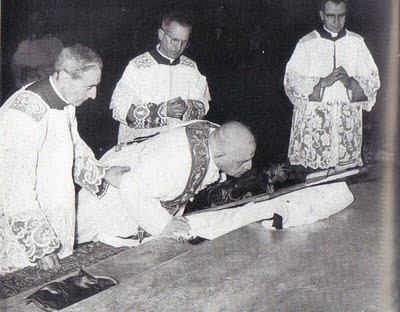 (11) Pope John XXIII himself, in 1959, at the celebration of Good Friday at Santa Croce in Gerusalemme followed the traditional practices, thus making evident that he was not in agreement with the innovations recently introduced and that he recognized the experimental nature of those changes. For each of the innovations cited there is given as well a commentary which relies as much as possible on the what the actual authors of the texts later stated; then there is also a brief sketch of the traditional practice. Commentary: This touches on one of the oldest customs, one which had survived from earliest antiquity until then and which showed forth the ancient nature of Holy Week, which no one had ever dared alter because of both the veneration with which it was regarded as well as the extraordinary nature of these rites and of the extraordinary sorrow of the Church during the days of Holy Week. Commentary: For the sake of the participation of the faithful, the idea is introduced of liturgical actions done facing the people, but with the back turned towards God: “Influential [in the reform] was the visibility of particular gestures in the celebration, detached from the altar and performed by the sacred ministers while facing the people.” (23) A blessing was invented that was performed over a table which stood between the altar and the altar rail, while the ministers faced the people. A new concept was introduced of liturgical space and of orientation during prayer. (MR 1952): The Roman rite often uses, for certain great liturgical moments, e.g. the consecration of the oils or priestly ordination, the singing of a preface, which is a particularly solemn way of calling upon God; likewise for the blessing of the palms a preface was prescribed which spoke of the divine order of creation and its subordination to God the Father, i.e. the subordination of the created order, which is admonished through kings and governments to be duly obedient to Christ: “Tibi enim serviunt creaturae tuae quia te solum auctorem et Deum cognoscunt et omnis factura tua te collaudat, et benedicunt te Sancti tui: quia illud magnum Unigeniti tui nomen coram regibus et potestatibus hujus saeculi libera voce confitentur” [“For thy creatures serve Thee, because they acknowledge Thee alone as their origin and God, and all thy work praises Thee together, and thy Saints bless Thee: for they confess with unfettered voice the great Name of thy Only-begotten before the kings and powers of this world”]. (28) In a few elegant lines, the text of this chant reveals the theological foundation of the duty of temporal governments to be subservient to Christ the King. Commentary: The reason for this–explains a note from the archives–is that these prayers are “replete … with all the showy display of erudition typical of the Carolingian era.” (30) The reformers agreed on the antiquity of the texts but did not find them to their taste because “the direct relation between the ceremony and daily Christian life was very weak, or rather [between the ceremony and] the pastoral-liturgical significance of the procession as homage to Christ the King.” (31) It is apparent to no one how there is lacking a connection to the “daily life” of the faithful or to the homage to Christ the King in its full “pastoral-liturgical significance.” Clearly, the plan was one of a kind of rhetoric that today appears dated, but at the time had a certain cachet. Though desiring a “conscious participation in the procession, with relevance to concrete, daily Christian life,” (32) they relied on arguments that were neither theological nor liturgical. The “concrete, daily Christian life” of the faithful is then indirectly disdained a few lines later: “These pious customs [of the blessed palms], although theologically justified, can degenerate (as in fact they have degenerated) into superstition.” (33) Apart from the poorly concealed tone of rationalism, one should note that the ancient prayers are deliberately replaced with new compositions, which, according to their authors’ own words, are “substantially a new creation.” (34) The ancient prayers were not pleasing because they express too clearly the efficacy of sacramentals, and it was decided to come up with new prayers. (MR 1952): The ancient prayers recall the role of sacramentals, which have an effective power against the demon (“ex opere operantis Ecclesiae” [“by the action of the Church as acting”). (35) 6. (OHS 1956): Novelty of unveiling the processional cross, (36) even though the altar cross remains veiled. Commentary: We admit that the liturgical significance of this innovation completely escapes us; the change seems to be a liturgical “pastiche” born of the haste of the authors rather than something related to mystical symbolism. (MR 1952): The altar cross is veiled as is the processional cross, to which is tied a blessed palm, (37) a sign once again on this day of the glorious Cross and the victorious Passion. (MR 1952): The procession returns to the doors of the church, which are shut. A sung dialogue between one choir of cantors outside, alternating with another inside the church, precedes the opening of the church doors, which takes place after the foot of the processional cross strikes against them. (40) 8. (OHS 1956): Creation of a prayer to be recited at the conclusion of the procession, at the center of the altar, the whole of which is recited facing the people (“versus populum”). Father Braga likewise openly admitted, fifty years later, that the creation of this oration was not a happy choice: “The element that is out of place in the new Ordo [of Holy Week] is the concluding oration of the procession, which disrupts the unity of the celebration.” (44) The “experimental” changes, motivated by a desire for innovations, have revealed with time their inadequacy. (MR 1952): The procession ends as usual, and then the Mass begins, as always, with the prayers at the foot of the altar. Commentary: The Passion had always been marked by a narrative style; it was divided among three voices and was followed by the Gospel, which was marked off by the fact that it was sung by a single deacon on a different tone, and was accompanied by the use of incense (but not torches). The reform confuses these two aspects. Passion and Gospel are melded into a single chant, while meretricious editing crops verses at the beginning and the end [of the passage]. In the end, accordingly, the Mass, as well as the deacon, is deprived of the Gospel properly so-called, which is, in effect, suppressed. Commentary: We now come to a pass that to us seems the most disconcerting, above all because it seems, as far as the archives reveal, that the Commission had decided not to change anything in regard to the Passion, since it was of the most ancient origin. (48) Nevertheless, we know neither how nor why the narrative of the Last Supper was expunged. It is hard to believe that for simple motives of saving time thirty verses of the Gospel would be struck out, especially considering the relevance of the passage concerned. Up till then, tradition desired that the narration of the Passion in the Synoptics always include the institution of the Eucharist, which, by virtue of the sacramental separation of the Body and Blood of Christ, is the herald of the Passion. The reform, with a single stroke aimed at a fundamental passage of Sacred Scripture, obscured the vital relation of the Last Supper, the sacrifice of Good Friday, and the Eucharist. The passage on the institution of the Eucharist was eliminated as well from Holy Tuesday and Holy Wednesday, with the astounding result that it is nowhere to be found in the entire liturgical cycle! This was the result of a climate of hasty change, which disrupted centuries-old traditions yet was incapable of considering the entirety of Scripture read during the year. (MR 1952): The Passion is preceded by the reading of the institution of the Eucharist, indicating the intimate, essential, theological connection between the two passages. Commentary: This move abetted the elimination of all references to the fact that the Church has enemies. The reformers’ “reason” desired to obscure, with euphemisms and the suppression of entire passages, the reality of the Church’s persecution at the hands of enemies both earthly and infernal, who struggle against the Church with both violence and the insinuation of heresy among the faithful. (So one reads in the suppressed prayer.) This same irenic attitude is encountered again on Good Friday, as Fr. Braga frankly admits. (51) In the same context, the concurrent suppression of the prayer for the Pope is decreed; and so begins the practice of reducing the presence of the name of the Roman Pontiff in the liturgy. Commentary: Here is the second, disturbing elimination of the Gospel passage on the institution of the Holy Eucharist as placed in relation to the sacrifice of the Passion. The suppression of approximately thirty verses does not seem to have been solely for reasons of time, considering, once again, the importance of these verses. Commentary: This is the third time one is struck by the elimination of the Gospel passage on the institution of the Eucharist in its natural connection with the sacrifice of the Cross. In this instance, as in the preceding, it is difficult to believe that for simple motives of saving time these thirty important verses were eliminated. Commentary: This is the beginning of the myth of concelebration on Holy Thursday. The bolder among the reformers wished to introduce it along with this reform, but resistance—especially from members of the Commission such as Cardinal Cicognani and Msgr. Dante—blocked this novelty. Father Braga writes: “As to the ‘participation’ of the priests, sacramental concelebration did not seem attainable (the mind-set, even of certain members of the Commission, was not yet prepared for it).” (58) In effect, there was a strongly hostile feeling against concelebration on Holy Thursday because it was not traditional: “Concelebration, whether sacramental or purely ceremonial, was to be excluded.” (59) To introduce the idea of concelebration, its proponents had to be content with the creation of the practice of having every priest present don a stole, (60) not at the moment of communion only but beginning with the start of the Mass. Commentary: It is incomprehensible why those present cannot communicate with hosts already consecrated previously. The Roman practice of the “Fermentum”—which is historically documented—was to communicate, in general, from a particle of the Eucharist from the Sunday prior, to show the communion of the Church throughout time and space, within the reality of the Body of Christ. This presence, being “real and substantial,” continues when the assembly departs and at the same time, with even greater logical coherence, precedes the reuniting of the assembly. With this [new] rubric, the idea is introduced of the Real Presence being tied to the day of the celebration, as well as the idea that one is obliged to communicate from hosts consecrated on the same day. It is as much as to say that those hosts are in some way different from those consecrated earlier. One should note that this obligation relates not merely to the symbolism of the tabernacle being empty before the Mass of Holy Thursday—which, at most, might have had some significance, albeit a novel one—since the text affirms that those who receive communion must receive only hosts consecrated on this day. (63) The underlying theology does not seem very solid, while the symbolism is debatable. Commentary: The reform appealed to a restoration of the “veritas horarum” [i.e., observance of the “true times” of the services], an argument used in season and out, like a veritable hobby horse. In this case, however, the chronological sequence given in the Gospel is abandoned. Rivers of ink flowed in order to convince others of the scandal of an horarium that was not in full accord with that of the Gospels, but in this case not only was a rite anticipated, or postponed, for practical reasons, but the chronological order of the Gospel narrative was inverted within a single ceremony. St. John writes that Our Lord washed the feet of the Apostles after the supper: “et cena facta” [“the supper having been finished”] (John 13: 2). It escapes understanding why the reformers, for whatever obscure motive, chose, arbitrarily, to put the washing of the feet directly in the middle of Mass. While Mass is being celebrated, consequently, some of the laity are allowed to enter the sanctuary and take off their shoes and socks. Apparently there was a desire to re-think the sacredness of the sanctuary and the prohibition of the laity from entering it during divine services. The washing of feet, therefore, is spliced into the offertory, an abuse whereby the celebration of Mass is interrupted with other rites, a practice founded on the dubious distinction of Liturgy of the Word and Liturgy of the Eucharist. Commentary: The third, despised Confiteor is done away with, without recognition of the fact that the confession made by the deacon, or the server, although borrowed from the rite for communion extra missam [outside of Mass], is a confession of the unworthiness of the communicants to receive the sacred Species. It is not a “duplication” of the confession made by the priest and ministers at the beginning of Mass, since at that point they have simply recited their own unworthiness to approach the altar and to celebrate the sacred mysteries. (Hence, at a sung Mass it is recited sotto voce.) This is distinct from one’s unworthiness to approach Holy Communion. Commentary: It was decided that everything should be stripped from the altar, even the cross. The rubrics of the reformed Holy Thursday do not explain, however, what to do with the altar cross, but one learns this by accident, as it were, from the rubrics of the following day. In effect, the rubrics of Good Friday speak of an altar without a cross, (71) which one can deduce from the fact that it was taken away during the stripping of the altars, or perhaps in a more private manner during the night. (This and other problems arise when one changes a liturgy which has benefited from layers of tradition and which is all but intolerant of hasty alterations.) Perhaps, on the basis of a certain liturgical archeologism, the reformers wished to prepare souls for the spectacle of a bare table in the middle of the sanctuary—something which makes little sense theologically. 1. (OHS 1956): The name “Solemn Liturgical Action” is devised, (73) thus eliminating the very ancient names “Mass of the Presanctified” and “Feria Sexta in Parasceve.” Commentary: The terminology of “Presanctified” underlined the fact that the sacred Species had been consecrated at an earlier ceremony and showed the connection with the return of the Eucharist, an important and ancient part of the rite. But the Commission despised this concept and decided to reform the name along with the rite itself: “[We need] to trim back the medieval extravagances, so little noted, of the so-called Mass of the Presanctified to the severe and original lines of a great, general communion service.” (74) The usage “in Parasceve” [i.e., Friday “in Preparation”] was no longer in favor, even though its Hebraic overtones indicate its great antiquity. Commentary: The cross, especially the one on the altar, has been veiled since the first Sunday of the Passion, so that it should remain where it naturally ought to stand, namely at the center of the altar, later to be unveiled solemnly and publicly on Good Friday, the day of the triumph of the redemptive Passion. The authors of the reform apparently did not like the altar cross and decided to have it removed to the sacristy on the evening of Holy Thursday, and not in a solemn way but in the containers used to carry away the altar cloths after the stripping of the altars, or perhaps during the night in some unknown way, about which the rubrics for Holy Thursday are silent. On the very day of greatest importance for the Cross, when it ought to tower over the altar even though veiled at the beginning of the ceremony, it is absent. The fact that it remained present for nearly fifteen days on the altar, though publicly veiled, makes for the logic of its corresponding public unveiling, instead of an a-liturgical return of the cross from the sacristy as though someone hid it there in a closet during the night. 3. (OHS 1956): The reading of the Gospel is no longer distinct from that of the Passion. Commentary: With this expressive ambiguity the idea is brought in of a Church in search of its own social unity, hitherto not possessed. The Church, according to traditional Catholic doctrine, solemnly defined, does not lack social unity in the earthly realm, since the said unity is an essential property of the true Church of Christ. This unity is not a characteristic that is yet to be found through ecumenical dialogue; it is already metaphysically present. In effect, the words of Christ, “Ut unum sint” [“That they may be one”], is an efficacious prayer of Our Lord, and as such is already realized. Those who are outside the Church must return to her, must return to the unity that already exists; they do not need to unite themselves to Catholics in order to bring about a unity that already exists. The aim of the reformers, however, was to eliminate from this prayer, says Father Braga, (87) some inconvenient words that spoke of souls deceived by the demon and ensnared by the wickedness of heresy: “animas diabolica fraude deceptas” and “haeretica pravitate.” By the same logic, they desired to do away with the conclusion, which expressed hope for a return of those straying from the unity of Christ’s truth back into His Church: “Errantium corda resipiscant et ad veritatis tuae redeant unitatem.” At any rate, it was not possible to reform the text of the prayer but only the title, since at the time—laments Father Braga again—“unity was conceived in terms of the preconciliar ecumenism.” (88) In other words, in 1956 the unity of the Church was conceived of as already existing, and God was being beseeched to bring back into this already existing unity those who were separated or far off from this unity. In the Commission there were members with traditional ideas who opposed the work of doctrinal erosion, though powerless to stop the creation of theological hybrids, such as the choice to leave the traditional text but to give it a new title. Annibale Bugnini himself, about ten years later, acknowledged that to pray for the future unity of the Church constitutes a heresy, and he mentions this in an article for L’Osservatore Romano that found fault with the title of the prayer “For the unity of the Church” introduced ten years prior by the Commission of which he was a member. Praising the prayers recently introduced in 1965, he writes that the prayer’s name was changed from “For the unity of the Church” to “For the unity of Christians,” because “the Church has always been one,” but with the passage of time they were successful in eliminating the words “heretics” and “schismatics.” (89) It is sad to note that these shifting maneuvers were employed with the liturgy in order to bring in theological novelties. Commentary: This time, the cross returns in a liturgical manner, i.e. publicly rather than placed into the hampers used to collect the candlesticks and flowers from the previous evening [the Mass of Holy Thursday]. In the liturgy, when there is a solemn procession of departure, there is a solemn return; this innovation makes for a solemn return of a symbol that, the evening before, was carried away together with other objects in a private form, placing it—in the best-case scenario—in a wicker basket. There seems to be, in fact, no liturgical significance for introducing this procession of the return of the hidden cross. Perhaps we are confronted with a maladroit attempt to restore the rite carried out at Jerusalem in the fourth and fifth centuries and made known to us by Egeria: “In Jerusalem the adoration took place on Golgotha. Egeria recalls that the community assembled early in the morning in the presence of the bishop … and then the silver reliquary [theca] containing the relics of the true Cross were brought in.” (92) The restoration of this procession of the return of the cross took place in a context that was not that of Mount Calvary of the early centuries but in the context of the Roman liturgy, which over time had wisely elaborated and incorporated such influences from Jerusalem into a rite handed down over many centuries. 7. (OHS 1956): The importance of the Eucharistic procession is downplayed. (94) Commentary: The procession with the cross is a new creation, but the reform decides to downgrade the return procession with the Body of Christ to an almost private form in an inexplicable inversion of perspective. The Most Holy Sacrament was carried out the day before in a solemn manner to the altar of the Sepulcher. (We deliberately use the name “Sepulcher” because all of Christian tradition calls it thus, including the Memoriale Rituum and the Congregation of Rites, even if the Commission members barely tolerated this term (95); it appears to us profoundly theological and suffused with that sensus fidei [sense of the Faith] that is lacking in certain theologians.) It seems logical and “liturgical” that there should be for a solemn procession like that of Holy Thursday an equally dignified return on Good Friday. After all, here there is a particle of the same Blessed Sacrament from the previous day, the Body of Christ. With this innovation the honors to be paid to the Blessed Sacrament are reduced, and, in the case of Solemn Mass [of the Presanctified], it is the deacon who is instructed to go to the altar of the Sepulcher to bring back the Sacrament, while the priest sits tranquilly resting on the sedilia. The celebrant graciously arises when Our Lord, in the form of the sacred Species, is brought in by a subaltern, and then goes to the high altar. Perhaps it was for this reason that John XXIII did not want to follow this rubric at the Mass celebrated at Santa Croce in Gerusalemme and desired to go himself, as Pope and as celebrant, to bring back the Most Holy Sacrament. Commentary: There is no apparent reason why the honors rendered to God on Good Friday should be inferior to those rendered on other days. Commentary: “The pastoral preoccupation with a conscious and active participation on the part of the Christian community” is dominant. The faithful must become “true actors in the celebration …. This was demanded by the faithful, especially those more attuned to the new spirituality…. The Commission was receptive to the aspirations of the people of God.” (100) It remains to be proven whether these aspirations belonged to the faithful or to a group of avant-garde liturgists. It remains as well to specify theologically what this above-mentioned “new spirituality” and its “aspirations” were. Commentary: It is true that on this day, in the strict sense, there is no Eucharistic sacrifice with the separation of the sacred Species, but it is also true that the consuming the Victim, immolated the preceding day, is a part, though not an essential one, of the sacrifice. This is, in a certain sense, the sacramental continuation of the sacrifice, because the Body, when consumed, is nevertheless always the Body as immolated and sacrificed. Accordingly, tradition always speaks of the sacrifice in the prayers connected with the consuming of the Host. 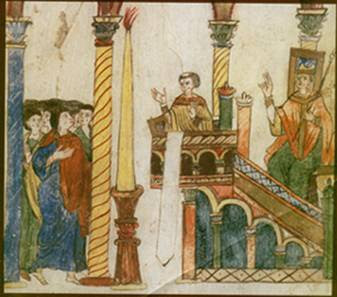 Some members of the Commission held that after so many years of tradition the time had come to correct errors and to declare that words such as “meum ac vestrum sacrificium” [“my sacrifice and yours”] were “completely out of place in this instance, since one is not dealing with a sacrifice but only with communion.” (103) The decision was then taken to abolish these age-old prayers. Commentary: Placing a particle of the consecrated Host (a rite also known in the Byzantine rite) into the unconsecrated wine obviously does not consecrate the wine, nor was that ever believed by the Church. 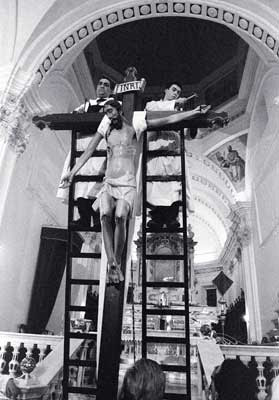 Simply put, this union manifests symbolically, though not really, the reuniting of the fragment of the Body of Christ with the Blood, to symbolize the unity of the Mystical Body in eternal life, the final cause of the entire work of redemption, which is not unworthy of being recalled on Good Friday. The “Memoire” preserved in the archives of the Commission affirm that this part of the rite absolutely had to be suppressed, because “the existence of a belief in the Middle Ages that the commingling of the consecrated bread [sic!] alone in the wine was sufficient to consecrate even the wine itself also brought about this rite; once the Eucharist was studied more profoundly, the lack of foundation for this belief was understood. But the rite remained.” (106) This affirmation is rendered scandalous by the absence of any historical foundation and by the scientific method; and it implies quite profound theological consequences. In addition, it remains to be proven historically that during the Middle Ages the belief under discussion was in currency. Some theologians may have held erroneous opinions, but this does not prove that in fact the Roman Church fell into error to the point that she made it part of the liturgy with this precise theological view in mind. (The belief that the wine is consecrated by mere commingling with the Bread of Angels was not unknown among medieval Catholics, and is still held by the Greek Orthodox, as shown by the rubrics of the Liturgy of the Presanctified as observed by the Greeks and by some Slavs. However, it was never officially accepted by Rome as a legitimate belief, and it is interesting to note that by and large the Russian Orthodox share the Roman stand. CAP.) In this context, one would be affirming that the Roman Church, conscious of the serious error, did not wish to correct it; one would be maintaining [in effect] that the Roman Church could change her view over the course of the centuries on a point that is so fundamental; and one would also be affirming that the she could err in relation to a dogmatic fact (such as the universal liturgy), and that for several centuries. Perhaps justification was sought for the work of reform already undertaken, which sought to correct all the errors that entire generations of Popes failed to detect but that the keen eye of the Commission had finally unmasked. It is not pleasant to note that these affirmations are imbued with a pseudo-rationalism of a positivist stamp, the kind in vogue during the fifties. Often it relied on summary and less than scientific studies in order to demolish those deplorable “medieval traditions” and introduce useful “developments.” (MR 1952): A part of the consecrated Host is placed in the wine, but, with great theological coherence, the prayer before consuming the Precious Blood is omitted. 12. (OHS 1956): The change of times for the service, which could have been accomplished in harmony with popular customs, ended up creating notable pastoral and liturgical problems. Commentary: In the past, pious customs and practices were developed in a way that was consonant with the liturgy. A common example in very many places: from noon, even today, a great crucifix is set up, in front of which the Tre Ore [“Three Hours”] of Christ’s suffering is preached (from noon until three o’clock). As a consequence of the change in time for the service, one is confronted with the paradox of a sermon delivered before the crucifix at a time when the crucifix ought to remain veiled, because the Good Friday service is to be held in the afternoon. (108) Some dioceses even today are constrained to hold the “Liturgical Action” [of the Passion of the Lord] in one church, while in another the ancient pious practices are conducted, in order to avoid a too obvious visual incongruity. Numerous similar examples could be adduced. It is clear, though, that the “pastoral” reform par excellence was not “pastoral,” because it was born of experts who had no real contact with a parish nor with the devotions and piety of the people—which they often enough disdained. Commentary: When this reform came into effect all the Paschal candlesticks in Christendom were rendered useless for Holy Saturday itself, even though some dated back to the dawn of Christianity. Under the pretext of returning to the sources, such liturgical masterpieces from antiquity became unusable museum pieces. The three-fold chanting of “lumen Christi” [“The light of Christ”] no longer has a liturgical reason to exist. 2. 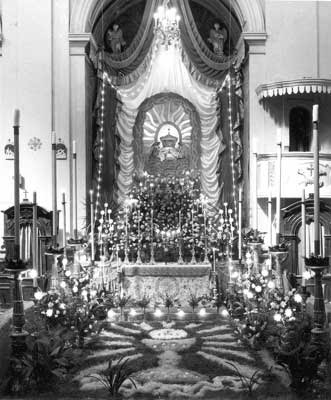 (OHS 1956): The fabrication of placing the Easter candle in the center of the sanctuary after a procession with it in a church that is progressively lit up at every invocation of “Lumen Christi” [“The light of Christ”]; and at every invocation all genuflect toward the candle [sic! ]; at the third invocation, the lights in the entire church are lit. (112) Commentary: After the fabrication of a procession with the candle, it was decided to have it placed in the center of the sanctuary, where it becomes the reference point of the prayers, just as it was during the procession; it becomes more important than the altar and the cross, a strange novelty that shifts the orientation of prayer in successive stages. Commentary: Some reformers wished to do away with this ceremony, but the love which the singing of the “Exsultet” was always enjoyed resulted in others opposing any change in the text: “the Commission, however, considers it opportune to preserve the traditional text, given that the passages to be eliminated are few and of little importance.” (115) The result was the nth pastiche of a traditional chant wedded to a rite now totally altered. Thus it happened that one of the most significant moments of the liturgical cycle became a theater-piece of astonishing incoherence. In effect, the actions spoken of during the singing of the “Exsultet” have already been performed about a half-hour before in the narthex. For the grains of incense there is sung: “Suscipe, Pater, incensi hujus sacrificium vespertinum” [“Accept, Father, the evening sacrifice of this incense”], (116) but they have already been inserted into the candle for a good while. The lighting of the candle with the light of the Resurrection is elaborated with the words: “Sed jam columnae hujus praeconia novimus quam in honorem Dei rutilans ignis accendit” [“But now we know the tidings of this column which the flickering fire lights to the honor of God”], (117) but the candle has long been lit by then and a goodly amount of wax consumed. There is no longer any logic. The symbolism of the light is twisted even further when the order of lighting all the lights—the symbol of the Resurrection—is triumphantly chanted: “Alitur enim liquantibus ceris, quas in substantiam pretiosae hujus lampadis apis mater eduxit” [“For it is nourished by the flowing wax which the Mother bee has drawn out unto the substance of this precious Light”], (118) but it is sung in a church which for quite some time has been totally illuminated by the candles lit from the new fire. This reformed symbolism is incomprehensible for the simple reason that it is not symbolic: the words being proclaimed have no relation to the reality of the rite. Furthermore, the singing of the Easter proclamation, in union with the actions that accompany it, constitutes the diaconal blessing par excellence. After the reform, the candle is blessed outside the church with holy water, but it was desired to retain a part of the ancient blessing since it had great esthetic beauty; unfortunately, this approach reduces the liturgy to theater. Commentary: This decision is simply extravagant and incoherent. Never was it known that an impetratory prayer was split into two parts. The introduction of the baptismal rites in the middle is of an even greater incoherence. Commentary: Basically, it was decided to substitute the baptismal font with a pot placed in the middle of the sanctuary. This choice was dictated, once again, by the obsession that all the rites should be carried out with the “sacred ministers facing the people,” (123) but with their back towards God; the faithful, by this logic, become the “true actors of the celebration …. The Commission was receptive to the aspirations poured out by the people of God …. The Church was open to the ferment of renovation.” (124) These reckless decisions, founded on a pastoral populism that the people never requested, ended by destroying the entire sacred edifice, from its origins until the present. At one time, the baptismal font was outside the church or, in succeeding ages, inside the walls of the edifice but close to the main door, since, according to Catholic theology, Baptism is the door, the “janua Sacramentorum” [“the door to the Sacraments”]. It is the Sacrament that makes those still outside the Church members of the Church. As such, it was symbolized in these liturgical customs. The catechumen receives [in Baptism] the character that makes him a member of the Church; therefore, he is to be received at the entrance, washed in the baptismal water, and thus acquire the right to enter into the nave as a new member of the Church, as one of the faithful. But, as a member of the faithful, he enters only the nave and not the sanctuary, wherein are the clergy, who are composed of those with the ministerial priesthood or who stand in relation to it. This traditional distinction was insisted on because the so-called “common” priesthood of the baptized is distinct from the ministerial priesthood and is distinct essentially, not superficially. They are two different things, not degrees of one single essence. With the mandated changes, however, not only the baptized (as was already done on Holy Thursday) but even the non-baptized are summoned into the sanctuary, a place set aside for the clergy. One who is still “prey to the demon,” because still with Original Sin, is treated just like one who has received Holy Orders and enters into the sanctuary even though still a catechumen. The traditional symbolism, consequently, is completely massacred. Commentary: After the creation of a baptistery inside the sanctuary, one is confronted with the problem of carrying away the baptismal water to some other location. It was decided, accordingly, to contrive a ceremony for carrying the water to the font after blessing it in front of the faithful and especially after conferring any baptisms as there might be. The transport of the baptismal water is accomplished while “Sicut cervus” is sung, i.e. that part of Psalm 41 which speaks of the thirst of the deer after it has fled from the bite of the serpent and which can only be slaked by drinking the water of salvation. At any rate, insufficient attention was paid to the fact that the deer’s thirst is sated by the waters of Baptism after the bite of the infernal serpent; for if Baptism has already been conferred, then the deer no longer thirsts, since, figuratively speaking, it has already drunk! The symbolism is changed and thus turned on its head. (MR 1952): At the end of the singing of the prophecies, the celebrant goes to the baptismal font, to continue with the blessing of the water and to the conferral of Baptism as necessary; meanwhile, the “Sicut cervus” is sung. (127) The chant precedes, as is logical, the conferral of Baptism. Commentary: One is, in a certain sense, proceeding blind when devising pastoral creations that have no true foundation in the history of the liturgy. Pursuing the notion that the Sacraments ought to be re-enlivened in the conscience, the reformers thought up the renewal of the baptismal promises. This became a kind of “examination of conscience” concerning the Sacrament received in the past. A similar tendency was observed in the twenties of the last century. In a veiled polemic with the provision of St. Pius X concerning the communion of children, the singular practice of a “solemn communion” or “profession of faith” was introduced; children of around thirteen years had to “remake” their first communion, in a kind of examination of conscience on the Sacrament already received several years before. This practice—although without calling into question the Catholic doctrine of “ex opere operato” [“from the work performed”]—emphasized the subjective element of the Sacrament over the objective. The new practice eventually ended up obscuring and overshadowing the Sacrament of Confirmation. A similar approach will be encountered in 1969 with the introduction on Holy Thursday of the “renewal of priestly promises.” With this latter practice is introduced a linkage between sacramental Holy Orders and a sentimental, emotional order, between the efficacy of the Sacrament and an examination of conscience, something rarely encountered in tradition. The substrate of these innovations—which have no foundation either in Scripture or in the practice of the Church—seems to be a weakened conviction of the efficacy of the Sacraments. Although not in itself a plainly erroneous innovation, it appears nonetheless to lean towards theories of Lutheran provenance, which, while denying that “ex opere operato” has any role to play, hold that the sacramental rites serve more to “reawaken faith” than to confer grace. It is difficult, moreover, to understand what was actually being sought with these reforms, since in fact edits were made to shorten the length of the celebrations, but tedious passages were introduced which burden the ceremonies unduly. (MR 1952): The renewal of baptismal promises does not exist, just as, in this form, it has never existed in the traditional history of the liturgy of either East or West. Commentary: The tone of this moralizing admonition betrays all too well the era in which it was composed (the mid-fifties). Today it already sounds dated, besides being a rather tedious adjunct. There is also the typical a-liturgical manner of turning to the faithful during this rite, a hybrid between homily and ceremony (which will enjoy great success in the years to follow). (MR 1952): Does not exist. Commentary: The Our Father is preceded by a sentimental-sounding exhortation. Commentary: Before the blessing of the baptismal water, the litany is recited kneeling; afterwards, a great number of ceremonies are performed, along with movements in the sanctuary; then there is the joy following the blessing of the baptismal water and any Baptisms that follow; and then the same impetratory prayer of the litany is resumed at the precise point where it was broken off a half-hour before and left hanging. (It would be difficult to determine if the faithful remember when they left this prayer half-finished.) This innovation is incoherent and incomprehensible. Commentary: It was decided that Mass should begin without the recitation of the Confiteor or the penitential psalm. Psalm 42, which recalls the unworthiness of the priest to ascend to the altar, was not appreciated, perhaps because it has to be recited at the foot of the altar before one can go up to it. 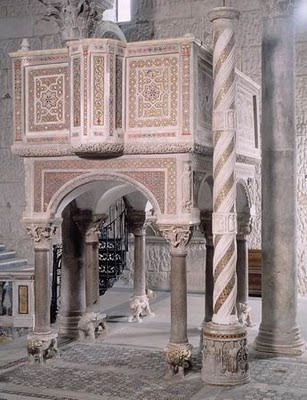 When one understands the underlying liturgical logic here relative to the altar viewed as the “ara crucis” [“altar of the Cross”], a place sacred and terrible, where the redemptive Passion of Christ is made present, a prayer expressing the unworthiness of anyone to ascend those steps makes sense. The disappearance of Psalm 42 (which in the following years would be eliminated from every Mass) seems, instead, to be a wish for a preparation ritual having to do with an altar that is, symbolically, a common table rather than Calvary. As a consequence, the holy fear and sense of unworthiness affirmed by the psalm are no longer inculcated. Commentary: This hasty abolition has all the marks of being tacked on at the last moment. Pentecost always had a vigil similar in its ceremonies to that of Easter. The reform, however, was not able to deal with Pentecost. But then again, the reformers could not leave untouched two rites which, fifty days apart, would have been, in the one case, a reformed version and, in the other, a traditional version. In their haste they decided to suppress the one they did not have time to reform; the ax fell on the Vigil of Pentecost. Such improvident haste resulted in rapid editing of the rites of the Vigil of Pentecost, so that the texts of the Mass which traditionally followed those rites no longer harmonized with them. Consequently, in the rite thus violently mutilated phrases remain which are rendered incongruous with the words of the celebrant during the Canon. The Canon presumes that the Mass is preceded by the rites of Baptism, which have been, however, suppressed. As a result, thanks to this reform, the celebrant recites during the special “Hanc igitur” words related to the sacrament of Baptism during the Vigil, whether the blessing of the font or the conferral of the Sacrament: “Pro his quoque, quos regenerare dignatus es ex aqua et Spiritu Sancto, tribuens eis remissionem peccatorum” [“For these, too, whom Thou hast deigned to regenerate with water and the Holy Spirit, granting them remission of their sins”]. (136) But there is not a trace of this rite anymore. The Commission, in its haste to suppress, perhaps did not notice. In conclusion, as already affirmed, the changes were not limited to questions of the horarium, which legitimately and sensibly could have been modified for the good of the faithful; rather, they overturned the age-old rites of Holy Week. Beginning with Palm Sunday, a ritual of “versus populum” is created, so that the back is turned towards the altar and the cross. On Holy Thursday, the laity are made to enter the sanctuary. On Good Friday, the honors rendered to the Most Blessed Sacrament are reduced as is the veneration of the Cross. On Holy Saturday, not only is the reforming imagination of the experts allowed to run wild, but the symbolism relating to Original Sin and to Baptism as the doorway into the Church is demolished. In an era that claims it desires to rediscover the Scriptures, the passages read on this most important of days are reduced, and the Gospel passages on the institution of the Holy Eucharist in Matthew, Luke, and Mark are edited out. Traditionally, every time that the institution of the Eucharist was read during these days, it was placed in relation to the account of the Passion, to indicate how completely the Last Supper was an anticipation of the death on the Cross the following day, and thus to indicate how much the Last Supper is of a sacrificial nature. Three days were dedicated to the reading of these passages: Palm Sunday, Holy Tuesday, and Holy Wednesday. Thanks to the reform, the institution of the Holy Eucharist disappears completely from the liturgical cycle! The entire raison d’être of the reform seems to be permeated with the whiff of rationalism and archeologism, with at times dollops of pure imagination. It is in no way intended to suggest that these rites lack the requisite orthodoxy, both because it would be unfounded and because the divine assistance promised by Christ to the Church even regarding what theologians call “dogmatic facts” (among which, we maintain, the promulgation of a universal liturgical law must be included) prevents a clearly heterodox expression within her rites. Having made this stipulation, though, we cannot excuse ourselves from noting the incongruence and extravagance of some of the rites of the reformed Holy Week, while at the same time upholding the possibility and liceity of a theological discussion of the same, in order to discover a true continuity of the liturgical expression of Tradition. To deny that the “Ordo Hebdomadae Sanctae Instauratus” is the product of a group of expert academics—joined unfortunately by opportunistic liturgical experimenters—is to deny the reality of the facts. With due respect to the papal authority that promulgated this reform, we are allowed to advance the criticisms which follow, since the experimental nature of these innovations requires that a balance be struck between such criticism and respect for authority. The liturgy is not a toy in the hands of the theologian or symbolist most in vogue. The liturgy draws its strength from Tradition; from the Church’s infallible use of Tradition; from those gestures which have been employed for centuries; and from a symbolism which cannot exist merely in the minds of free-thinking academics but which corresponds to the consensus of clergy and people who have prayed in that manner for ages. Our analysis is confirmed by the synthesis of Father Braga, a protagonist extraordinaire of those events: “That which was not possible, psychologically and spiritually, at the time of Pius V and Urban VIII because of tradition [and we would like to emphasize “because of tradition”], because of insufficient spiritual and theological formation, and because of a lack of acquaintance with the liturgical sources, was possible at the time of Pius XII.” (138) While we share his analysis of the facts, we might be permitted to object that Tradition, far from posing an obstacle to the work of liturgical reform, is the foundation for it. To treat of the era following the Council of Trent with disdain and to define Saint Pius V and the popes that followed him as men of “insufficient spiritual and theological formation” is presumptuous and proximate to heterodoxy in its rejection of the centuries-old work of the Church. It is no mystery that this was the climate in the fifties and sixties during the reform. Under the pretext of archeologism, the millennial wisdom of the Church was replaced by the caprice of personal judgment. Acting in this way, one does not reform the liturgy but deforms it. Under the pretext of restoring ancient practices–about which scientific studies of a dubious and fluctuating value have been written–one gets rid of tradition and, having torn the fabric of the liturgy, now makes a flawed patch job by sewing on an archeological discovery of unlikely authenticity. The impossibility of an integral revival of rites that—if they ever existed—have been dead for centuries results in handing over the remaining work of “restoration” to the free flight of the “experts'” imagination. 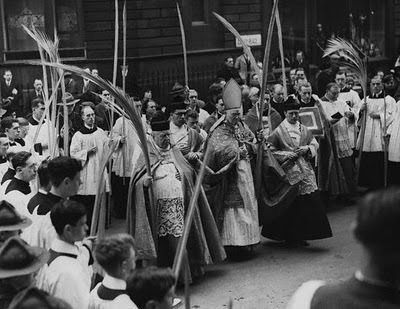 The over-all judgment on the reform of Holy Week is mainly rather negative: it certainly does not constitute a model of liturgical reform (thanks, in part, to the artificial way it was pieced together and its use of personal intuitions at odds with tradition). The case of the reform of 1955-1956 was analyzed because it was, according to Annibale Bugnini, the first occasion for the inauguration of a new way to conceive of the liturgy. The rites produced by this reform were used universally by the Church for very few years, amidst a continual succession of reforms. Today, that artificial way of conceiving of the liturgy has been left behind. The great work of re-appreciating the riches of the liturgy of the Roman rite is making headway. Our sight must be set unceasingly on what the Church has done for centuries, in the certainty that those ancient rites have the benefit of the Holy Spirit’s “unction.” As such, they constitute an irreplaceable model for every work of reform. The then-Cardinal Ratzinger has this to say: “In the course of her history, the Church has never abolished or prohibited orthodox forms of the liturgy, because that would be foreign to the very soul of the Church.” (139) These forms, especially those going back a millennium, remain the guiding light for every work of reform. Cf. S. Congregation of Rites, Decr. “Dominicae Resurrectionis,” Feb. 9, 1951: AAS 43, 1951, pp. 128 et ss. ; Decr. “Maxima redemptionis nostrae mysteria,” Nov. 16, 1955: AAS 47, 1955, pp. 838 et ss. A. Bugnini, The Liturgical Reform (1948-1975), Rome, 1983, pp. 17 et ss. C.Braga, “‘Maxima Redemptionis Nostrae Mysteria’: 50 anni dopo (1955-2005)” in Ecclesia Orans, n. 23 (2006), p. 11; the author clearly affirms that he witnessed the reforms first-hand and that he actively assisted it by his labors. A.Bugnini, C.Braga, Ordo Hebdomadae Sanctae instauratus (Bibliotheca Ephemerides Liturgicae, sectio historica 25), Rome, 1956; for historical-critical commentary see also: Sacra Congregatio Rituum, sectio Historica, n. 90, De instauratione liturgica maioris hebdomadae. Positio: Typis Pol. Vaticanis, 1955. For the published works of Annibale Bugnini which were to prepare for the reform, cf: A. Bugnini, “De solemni Vigilia Paschali instauranda. Commentarium ad decretum 9 febr. 1951,” in Ephemerides Liturgicae 65 (1951) suppl. ad fasc. I (also published in the collection Bibliotheca Ephemerides Liturgicae, sectio historica 24); “Il primo esperimento della Veglia Pasquale restaurata,” in Ephemerides Liturgicae 66 (1952). A. Bugnini, The Liturgical Reform., op. cit., p. 19. N. Giampietro, op. cit., pp. 320-327; the traditional rite, nevertheless, was allowed to be retained in the Holy Land up until 2000. See the adjoined photographs and the confirmation given by Msgr. Bartolucci, who received the order from Msgr. Dante to use the traditional rites; P. Cipriani, S. Carusi, edd., “Intervista a Mons. Domenico Bartolucci, su Disputationes Theologicae” (http://disputationes-theologicae.blogspot.com/2009/08/mons-bartolucci-interviene-sulla.html and translated by Rorate Caeli: http://rorate-caeli.blogspot.com/2009/08/bombshell-of-interview-mons-domenico.html). C.Braga, op. cit,, p. 33. Archives of the Congregation of Saints (originally the Sacra Congregatio Rituum), “Annotazione intorno alla riforma della liturgia della Domenica delle Palme,” p. 9, cited in N. Giampietro, op. cit., p. 309. OHS 1956, p. 3; cf. as well note 13. P.Martinucci, Manuale Sacrarum Caerimoniarum, Rome, 1912, Editio tertia, pars I, vol. II, p. 183. N.Giampietro, op. cit., pp. 304, 305. OHS 1956, p. 15; the text contains a prohibition against adding the old prayers. C.Braga, op. cit., p. 28; N. Giampietro, op. cit., pp. 304, 305. OHS 1956, p. 55, rubric n. 4. OHS 1956, p. 55; also, the tabernacle must be emptied of any previously consecrated Hosts. OHS 1956, p. 65; alternatively, the removal of the cross is included in the vague passage: “celebrans (…) denudat omnia altaria ecclesiae” [“the celebrant …strips all the altars of the church”], ibid., p. 63, note n.7. For the meaning to be assigned to these terms see the decree of the Sacred Congregation of Rites of June 10, 1948, in Acta Apostolicae Sedis, XL, 1948, p. 342. 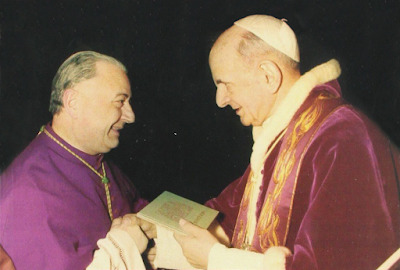 A.Bugnini, “Le nuove orazioni del Venerdì Santo,” in L’Osservatore Romano, March 19, 1965. C. Braga, op. cit., p. 28. A confirmation of this aversion on the part of some members of the Commission for the expression “sepulcher” can be found in N. Giampietro, op. cit, p. 312. MR 1952, p. 179-185; in terms of history, it is possible to discuss the evolution of the relation of the sung parts with the gestures, with various eras being assigned for the introduction of gestures in relation to the evolution of the text; nevertheless, it cannot be denied that the development of the symbolism of the ritual gestures and the meaning of the words has been fixed for centuries in a harmonious way and under the seal of tradition. OHS 1956, p. 111; a somewhat confusing rubric is foreseen for rubric no. 23 in the case of a baptistery located apart from the church; in this case, the “Sicut Cervus” is sung at a convenient point. It is impossible to understand the reason for this inconsistency which contradicts the preceding rubric. Joseph Card. Ratzinger, “A dieci anni dal motu proprio Ecclesia Dei”, a conference given on Oct. 24, 1998.